As we tramped along the cobbled path, a high pitched squeal caught our attention. The squealing became increasingly frantic and we finally spotted the source. Four young boys were wrestling with a large and very vocal pig. With some effort they managed to hog-tie the pig and manhandle it onto their motorbike. Two boys carefully balanced the porky package as the bike struggled up the hill. The other two set off on foot as their places on the bike had been usurped. We later saw the boys dividing up a handful of tattered notes, presumably their payment for the pig. As well as having Galtaji Temple and Nahargarh Fort, the Aravalli Hills surrounding Jaipur are an interesting place for a walk. We followed the track uphill from Jaipur aiming for Surya Mandir, the pristine white sun temple that overlooks the city. Pausing for a look around the temple, we also took a moment to appreciate the hazy views. We then continued into the valley in search of Galtaji, otherwise known as the Monkey Temple. 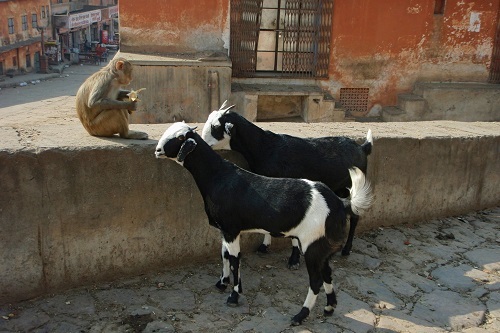 The monkeys appeared long before we reached the temple, sitting by the path stuffing their faces with fruit. 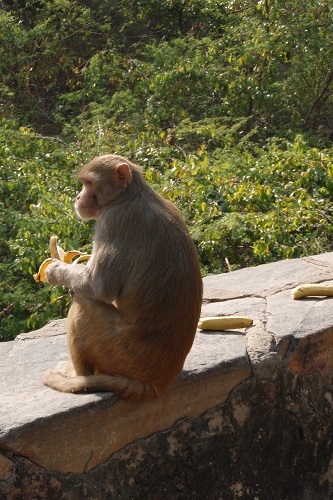 Unlike other monkeys we have encountered, these were too busy eating to pay us any attention. 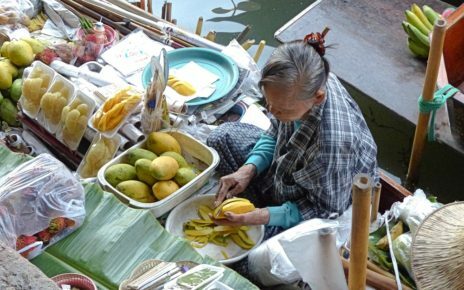 We soon came across the source of their snacks, an elderly man leaving a dense trail of bananas along the path. Descending into a ravine, we came across the first buildings of Galtaji. As the only people there, we were quickly accosted by a local man who gave us our first blessing. He smudged a red spot onto our foreheads while chanting a mantra for luck. Tying a string around our wrists to 'keep us safe', he then offered us sweets and encouraged us to pray. Of course, we were also expected to leave a few rupees as an offering to the temple. 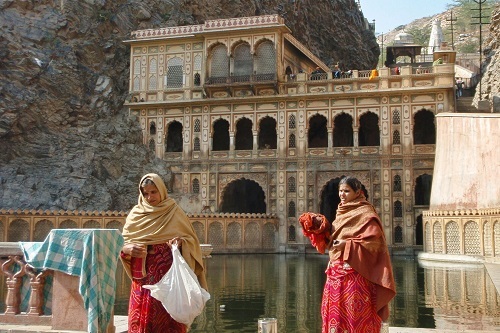 Further into the temple complex, we came across a series of pools fed by a natural spring. Pilgrims come to bathe in this sacred water and we saw plenty of Indian tourists snapping selfies there. Some women were even doing their washing in the holy water. The pools were murky green and uninviting so we didn't feel inclined to take a dip. The main temple buildings at Galtaji were impressive with detailed stone facades topped by a row of domes. 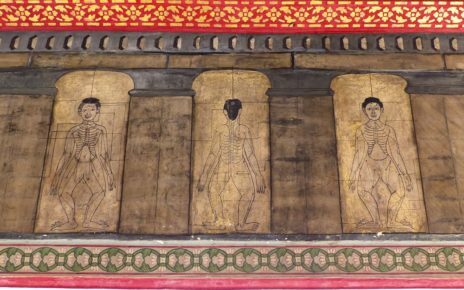 Some of the walls had frescoes depicting Hindu legends but other areas were quite dilapidated. 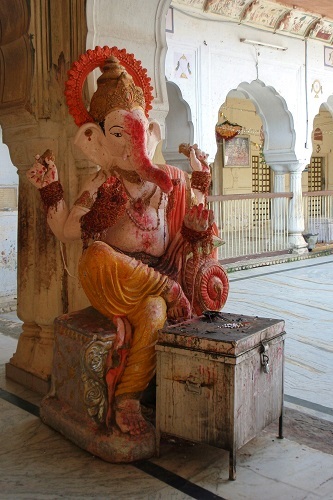 One temple we entered was dedicated to Ganesha and we saw large statues of the elephant god liberally smudged with red powder. We also found a well hidden tribute to the monkey god. 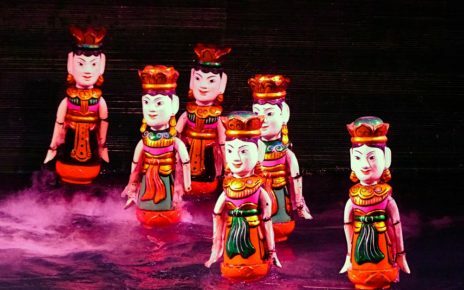 We were led through the back of the temple into a cramped windowless room, dimly lit by candlelight. This secret room was dedicated to Hanuman, the monkey god. It was time for another blessing. Our host splashed us with perfume and tickled us both with a large feather. He then added an orange dot to the red mark already on our foreheads. We left the obligatory offering and returned to daylight. Another foray into the Aravalli Hills took us up a zigzagging path to Nahargarh, the Tiger Fort, which perches on a hilltop overlooking the Pink City. From our vantage point, the Pink City didn't really live up to its name. The jumble of cubic buildings below us was a cheerful mix of blue, green and yellow as well as the eponymous pink. Aside from the outer wall, the only remaining part of Nahargarh Fort is a series of royal apartments used to house the Maharajah's harem. 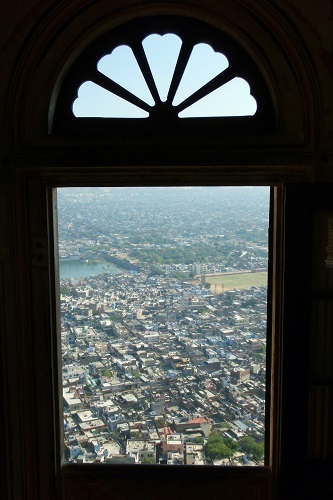 Each of the ruler's concubines was given a spacious 2-storey apartment with a spectacular view across Jaipur. A secret corridor allowed the Maharajah to access each of the apartments, unseen by the other wives. The apartments were well preserved with delicate floral frescoes adorning the walls. The one exception to this was a dingy room with peeling paint and stained walls. As we entered, the first thing we noticed was the pungent smell. We then spotted the colony of roosting bats dangling from the walls. They quietly twitched and moved around in a somewhat unnerving manner. As we left the palace apartments, a small amphitheatre caught our attention and we wandered over for a closer look. 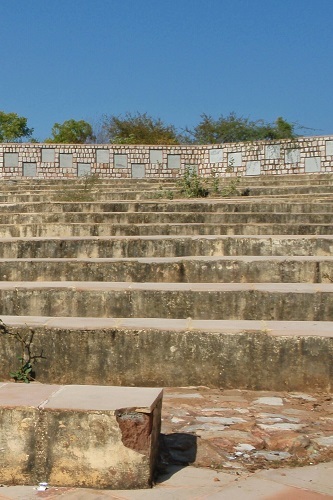 Our guidebook gave warnings about the 'delinquent teenagers' at Nahargarh Fort and we saw a few groups of young boys hanging out near the amphitheatre. The reality was not so sinister. The first kids we passed were flying kites, a popular pastime in India. They chatted to us and even gave us a turn flying one of their kites, which we did with considerably less skill than them. Continuing on our path, we met an extremely polite young man with closely cropped hair and a leather jacket. He may be the first person ever to have asked our 'good names'. With this information he introduced us to the rest of his biker gang. The last group we met were much younger. We posed for selfies with them, at their request, before they offered us advice on the best route through the waste ground. We found walking in the Aravalli Hills a welcome break from the craziness of central Jaipur. 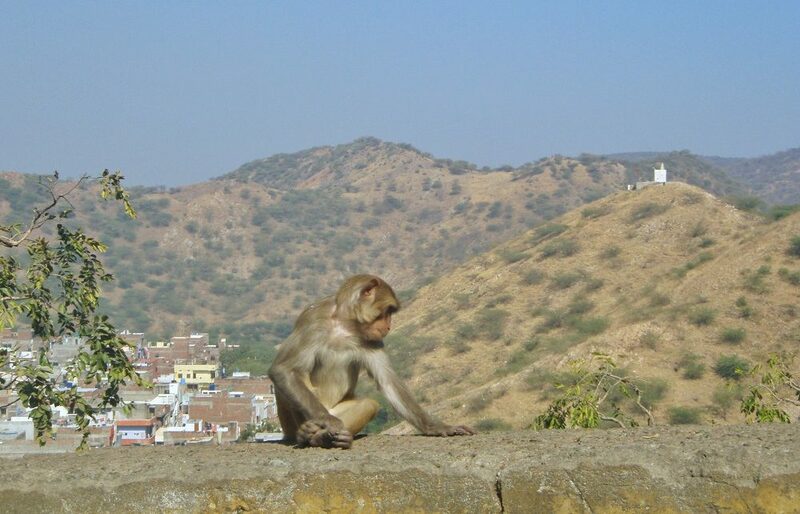 Both Nahargarh Fort and Galtaji were reasonably quiet when we visited. The locals we met around Nahargarh Fort were genuinely friendly and weren't trying to sell us anything, which made a refreshing change. Galtaji had spectacular scenery and the wildlife we encountered en route was an added bonus. 1: Walk up the path behind Surajpole gate, one of the old city gates on the eastern side of Jaipur. The path climbs up to Surya Mandir before dropping into a valley beyond. 2: Take a tuk-tuk by road to Galtaji. This is a longer route, around 10km from Jaipur, and you will enter from the other end of the complex. We did not see anywhere to buy food or drinks on the path we took to Galtaji. Make sure you are well supplied with snacks and plenty of water. We met several people at Galtaji who were keen to give us blessings. They also told us a little about the temple. Afterwards, we were expected to leave an offering. Have some small change to hand for this. 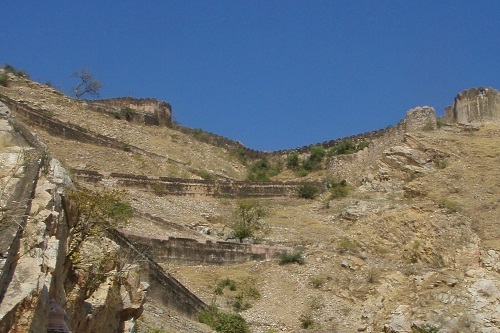 1: Climb the short path on the northern edge of Jaipur. The start of the path is around 2km from the City Palace. 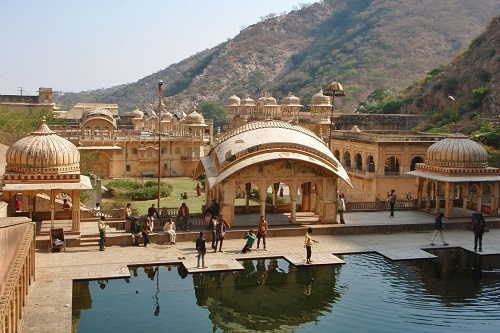 2: Take a tuk-tuk by road to Nahargarh Fort. 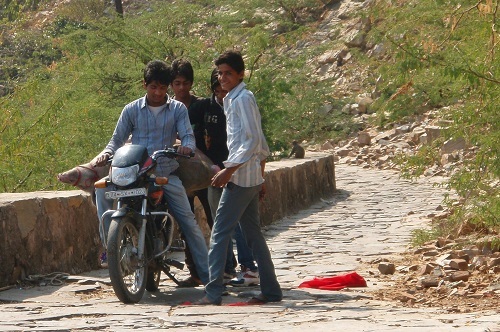 This is a longer route, around 15km from Jaipur. There is a cafe at Nahargarh Fort. If you're walking to the fort, you will still need to bring plenty of water with you.